Are You a True Supporter or just skimming the cream? There are a lot of cool Open Source projects out there these days that usually produce some sort of free (as in beer) software, being it a small tool, a plugin for another application or a complete application by it self. Some of it is of poor quality, but this is definitely not the rule. Most people don’t really think longer than that they get this piece of software for free, and how great it is to not have to pay for things. What I’m trying to convey with this post is that there are usually an immense amount of work behind all of these projects and usually the developers and designers don’t earn much, if anything for doing this work. Would you spend maybe 50 – 90 % of your spare time working for free? Even if you believed in what you where doing it’s quite a commitment. My point is that it is actually possible to donate a tiny sum of money once in a while or each month automated via PayPal if you can afford, at least for those software projects you’re using day in, day out without paying a cent in licence or maintenance for doing. I use and enjoy Blender. It has become a rather huge project with a lot of good developers working on the project, and it has even got a couple of full-time, paid developers to work on it. 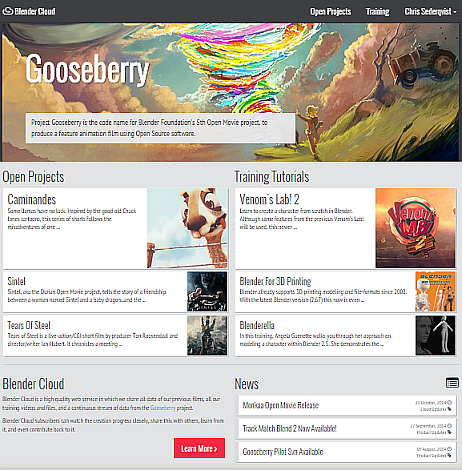 And if you haven’t discovered the cool Gooseberry Project, take a visit to their homepage and look around a little. The Blender Foundation and the Gooseberry Project is cooperating on many levels these days, there is even a special Gooseberry edition of Blender that you can download from the Blender Build-bots. There is a lot happening to the former Blender Shop where you could buy tutorials and books from individual companies as well as from more or less community acclaimed Guru figures from the “Blender world”, in addition to accessories like T-Shirts and other apparel. Now there is a really interesting project going on called the “Blender Cloud”, that merges many of the sources of information and especially components from the Open Movie projects like Sintel, Tears of Steel and much more. They have a subscription based service that is in its infancy yet, but fully worth the price of around $9 / month already, as you can view and download many of the earlier products sold on the Blender Shop and maybe the most valuable, you get direct access to all assets used when making movies like Sintel. Complete with finished models, scenes, scripts, concept art and absolutely everything that was stored while producing these projects. Now this is a SUPERB way to learn how a real world project like this gets done. So, show some real commitment to the Blender Foundation, by subscribing to the Blender Cloud ever expanding service of useful resources.